My City: Lugano, Switzerland as a matter of choice. Forum Username: prz (short from Przygienda, yes, it's 5 consonants one after another, don't ask me how to pronounce it, even in Polish it's tad of a tongue-twister). when you work on exercises a lot). •	I gave away a rock-you-guitar to a nephew and shopping for a travel guitar now. Tip: Give away gear, gives you excuse to buy new stuff then. 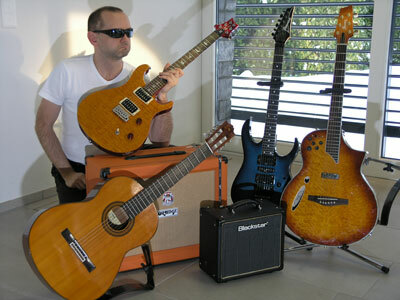 •	I played for about a year a Japanese made GR570 which is pretty nice rock axe and still my quick-rhythm one to go to. •	Acoustic Ibanez Montage 650 which is poor stepchild to the Taylor hybrids (but a better value in terms of price and yepp, I'm a cheapskate). mod it up a little since I gulped dry @ the real PRS price tags. I will probably buy over time a real one and some Strats as well and finally listen more to Gibbies. I really dig Gibson sound but I'm particular to thinner necks so I won't probably find one that pleases my fretting hand. acoustic I use Behringer UltraGain Tube Preamp and for electric I am loving my tubie Blackstar with a huge orange 12" celestion cab to death now. Then lots of small fry like cheap pedals (yepp, cheapskate), tuners and such stuff. To record I use a Phase 88 firewire producer I got cheaply. I have a feedback destroyer pro which is invaluable, especially when you're plugging in an acoustic. Disclaimer: No commercial interest in any companies mentioned except giving them my hard-earned money for the gear I buy from them. I listen to lots & lots of stuff and always did, some of it pretty eclectic. From Gregorian Chant to rock anything goes if it's good. I am surely particular to Bach, Mozart, Josquin, Pink Floyd, Queen, Radiohead, Eicher, Talking Heads, Coldplay, lots of Opera (recorded and live), Organ music and so on. Well, none and that's the problem. I'm just pursuing too many styles. First I thought I be into lead-guitar (who doesn't, that's the chicks & money and that's for free if you believe Knopfler) but realized that it's a style with too many restrictions for my taste so I do also travis/blues fingerpicking which goes slow since it's so hard but you can play solo and make a good stand with it. want a lead-diva in their midst. Well, really ? Tinnitus. I had major back problems & tinnitus (life & work took its toll and some stupidity pushing things did not help either). Being a researcher by vocation and quite analytical I realized that playing a music instrument (and guitar had most appeal) is the perfect cure for both. more fulfilling to make music than listen to it so my hi-fi gear gathers dust now. I played by tabs for about 3 months something like 20+ years ago and then never touched anything except tennis rackets & golf clubs a lot which do not qualify much as music instruments. So, here you go: I wasn't to be afraid with 40+ to pick up a piece of hollow wood with guts on it (a tennis racket is basically the same concept, just different shape and less variation in pitch). If you house were on fire, which instrument would you grab? My wife and my daughters and my head and my hands. If my guitars burn, reason to buy new & more costly ones, the skill stays. Some things in life can be replaced, some can't. together where it's all gi-tarrs and gi-ear. Playing with my daughters who are already couple years down the piano path. The ones I more seriously pursued: a decent amateur tennis player, decent golf amateur player and I loved (and still love) to write software which was a job for 20 years and still is. I have many interests beside that but those run under fleeting distractions like flying planes for couple years. I chose and could afford to become independent when my first daughter was born (instead of following further my 'real' career). If you're really interested in my non-guitar professional life www.zeta2.ch is my company where I'm the bottle-washer & CEO.